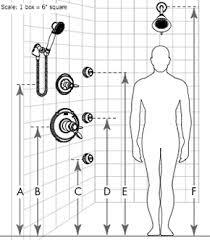 ​Thought this was a really useful diagram to help place plumbing components in a shower. Sometimes it's hard to decide exactly where you want those great massage jets to hit. This is my first attempt at blogging. I thought it would be a good way to keep everyone up to date on what is happening at M B Smith Design and also share ideas. So stay tuned. I've gotten this far! Here is a old photo I found. You can tell it's vintage 1960s from the avocado green fabric! 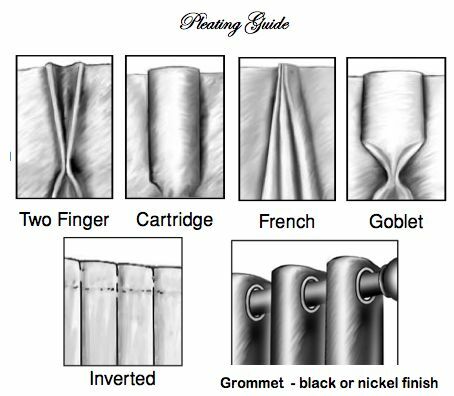 But it's still useful info, showing some of the different types of pleating you can use for draperies. Then I got to looking and found two more helpful charts. 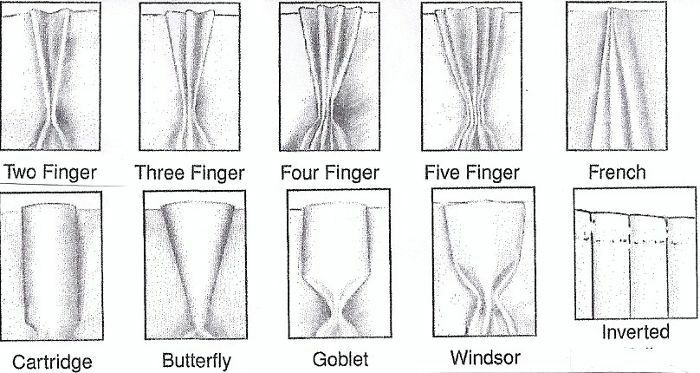 Good to know and be able to 'speak the same language' as your drapery maker. 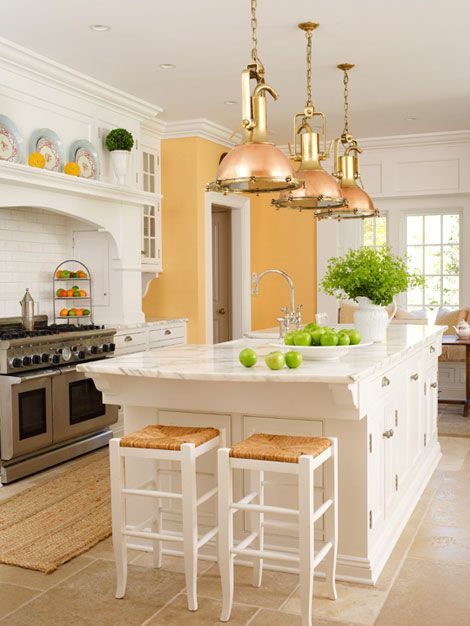 This is certainly a very nice kitchen but what's really great are those antique copper ship lights over the island. Such a creative idea for repurposing. Although not quite as cool as these, I actually found some interesting fixtures made from old chicken coops down at Circa 1857(in Baton Rouge) which I used in a recent renovation. 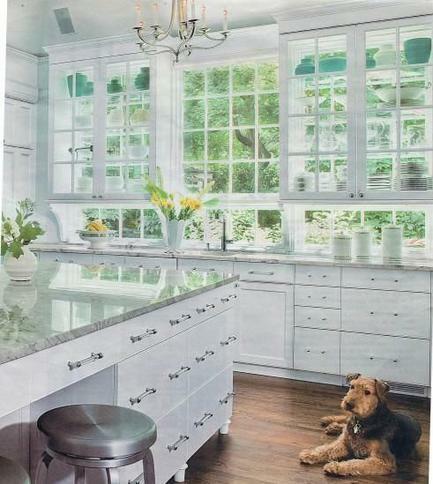 This photo came from Traditional Home magazine's site which has lots of good pictures and articles. It's worth a look. I just wish I had access to the same salvage yard as this designer! 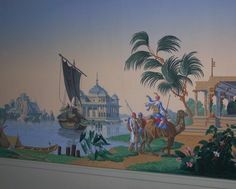 Here are three photos of Zuber wallpaper that are just so luscious I had to share. 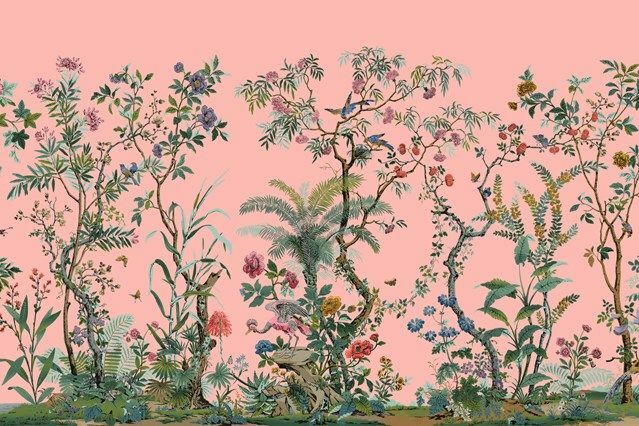 Zuber is a French company that has been producing hand blocked(printed from carved wooden blocks), handpainted wallpaper since the 18th century. The papers show a variety of subjects as landscapes-scenes from exotic locales, fox hunts, pastoral settings, Chinese gardens, etc. They're not for everyone no doubt, but if you want to make a statement you might consider them.These papers are of course very pricey, but I have heard that a company called Yrmural Studio produces replicas for a more reasonable rate. 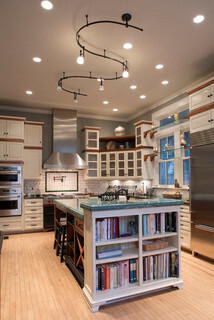 Here is a photo of a lavish kitchen and den full of many lovely ideas. 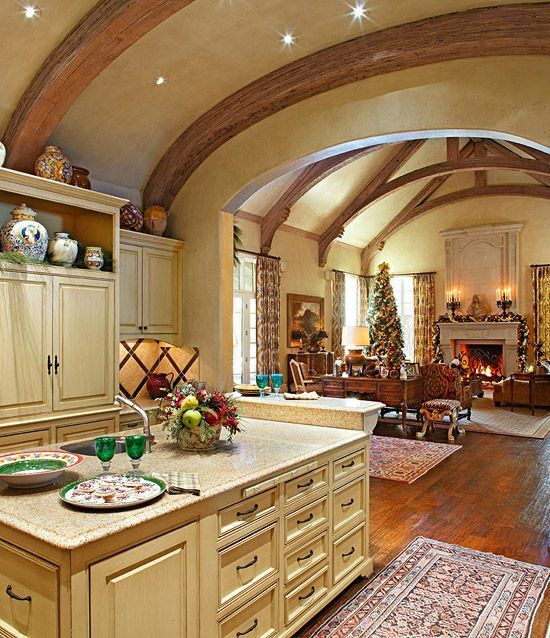 But what I think is totally beautiful is that vaulted and medieval beamed ceiling. While most of us can't have a ceiling quite so spectacular, there are some creative(and relatively simple)ways we can make ours more interesting and dimensional. For example, you can build in faux coffers right on top of your existing drywall ceiling with ordinary wood beams and raised or recessed panels. Here's one way to let in some light! Cabinets that double as windows. Kind of a nifty idea. The crisp white paint, lovely gray marble counter tops, nice dishes collection, and gorgeous view all do add to things considerably. And of course you would need a very skilled carpenter/mill work man to do this intricate a job. Thought I would share some pics from a recent renovation. This is some tile work that I designed for the master bath in a circa 1910 Arts and Crafts home. We were aiming for a period appropriate look without sacrificing modern comforts. Everything in the photos is new, yet could pass for antique. 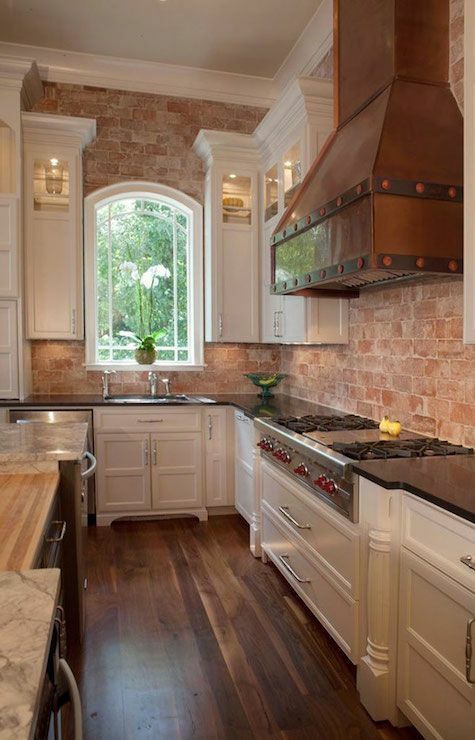 Here is a photo I came across of a kitchen with brick walls and backsplash. I think it looks great. 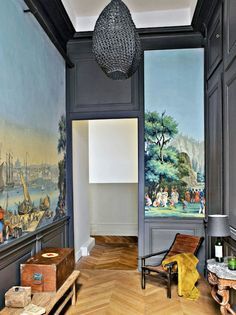 I love the way that the one material covers the whole wall. With tile, marble, and granite so popular right now we forget about good old brick. The rough texture of the brick works so well with the smooth, painted white cabinets. And check out that extremely handsome copper hood. A very nice combination of design elements. Here's an easy way to update your cabinets. 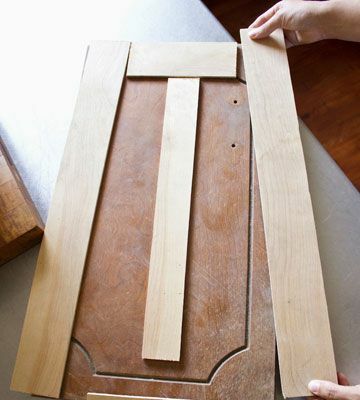 Shaker style has become very popular and this is a simple DIY way to get it. Cut the wood strips to size, glue them on, caulk, paint, done! This is an interesting article with some good ideas about paint. 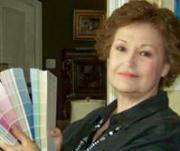 It give you some ideas to liven up paint colors while still remaining 'neutral'. I thought the way they designed the upper corner cabinets were kind of cool and different. 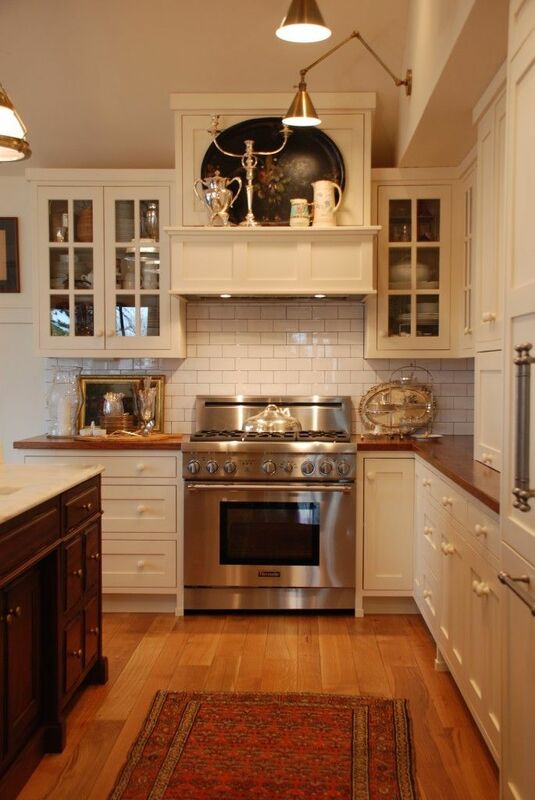 Also like the use of stained wood mixed in with the painted cabinets. It wouldn't work for everyone but I think it's successful here. 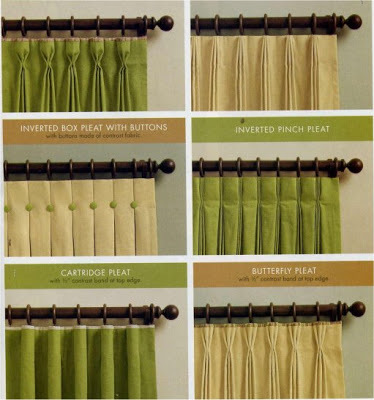 I found this on a website called Houzz, an interesting and useful site to get ideas and shop. Posted this because I thought this hood design was nice. I don't think I've seen one exactly like it before. It's clean and classic but with enough detail to make it interesting, plus it also has a shelf for display.